Jeff For Banks: How About Profits in the Branch of the Future? 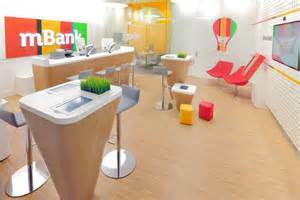 “[Sample] Bank has reinvented banking with the opening of the [Branch of the Future]. 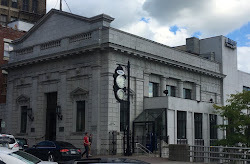 To experience the future of banking today, simply step across the threshold.” So went the 2012 press release announcing the opening of the next generation of the bank branch. At June 30, 2014, that branch had $23 million in total deposits, down $1 million from one year ago. The branch of the future concept was not enough to inspire customers to open accounts in droves while sipping coffee and surfing the net. Branch demand and utilization by customers is changing rapidly, and there is no shortage of opinions on the look and feel of the branch of the future. I recently read an article about Poland’s mBank that is designing kiosk and light branches to complement their traditional branch network (see photo). The smaller branch concept gets significant play in professional publications. But let’s not forget that we have past experiences with a “light branch”; namely the declining in-store branches. These branches were notorious for being low-balance transaction-oriented branches that did not enjoy great success. From first-hand experience training in an in-store branch, I found it difficult to attract higher balance and small business customers, significant contributors to branch balances and therefore profits. This highlights an important banking concept: revenues are mostly driven off of balances, not activity. mBank’s light branch depicted above is located in a mall. Malls are experiencing difficulty in the United States, as millennials opt for smaller, urban environments to shop. And the rest of us are increasingly buying online. So putting a light branch in a mall that is being vacated by Macy’s may not be a winning strategy if your bank’s objective is to increase visibility through strategically located, yet smaller branches. All talk of visibility and foot traffic aside, the measure of branch success should be profits. In the chart below, derived from The Kafafian Group’s (TKG) peer database of hundreds of community bank branches, we see that the revenue generated from deposit spreads, asset spreads (typically consumer loans), and fees (typically deposit fees) as a percent of branch deposits averaged 2.08% for commercial banks and 1.88% for thrifts during 2014. This is down from 4.17% for banks and 2.51% for thrifts in 2006. So if your “light branch” has $23 million in average deposits, as our “branch of the future” example above does, then it generates $478,400 in annual revenue, on average. Not very inspiring. Since 2006, community banks have recognized the need for greater balances in branches to improve profitability. See the next chart for average branch deposit size trend from the TKG database. Interestingly, the average branch deposit size for thrifts declined. This phenomenon is largely attributable to the 2008 recession and the ensuing drop in loan demand which allowed thrifts to run off their high rate CDs. 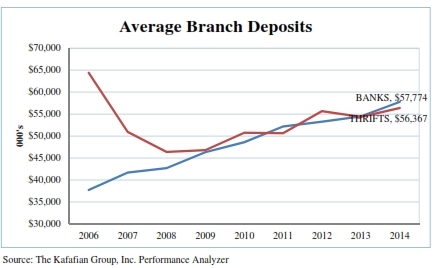 But since that drop-off, the increase in average branch deposits can be attributed to: 1) deposit growth without the commensurate growth in branches, and 2) pruning branch networks without significant deposit attrition. 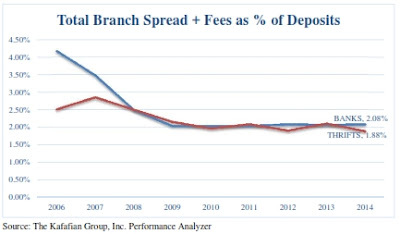 Branch deposit growth combined with reviews of transaction activity to reduce branch personnel has buttressed the decline in deposit spreads and fees, and branch profitability. But not to the point of the profits enjoyed by branches in 2006, which was approximately 2.73%, compared to 0.86% in 2014. These pre-tax profit ratios are a percent of average branch deposits, and excludes indirect branch operating expense such as Deposit Operations and IT, and overhead such as Executive and Finance. Not only are branches not supporting the army of support aligned behind them, they are barely supporting themselves. I have written and spoken about accountability for branch profitability. Accountability gets a bad wrap. It can convey pressure, discipline, and failure. Applied correctly, accountability could promote focused effort, rewards (financial and non-financial), and triumph. Imagine holding branch managers accountable for increasing deposit and loan spreads, and generating direct pre-tax profits. Those that rank as top tier performers receive meaningful incentive compensation and recognition. Branch administrators charged with the profitability of the branch network won’t fear pulling the plug on profit laggards, because they are dragging down the profits of the whole. Who cares if a director drives by the unprofitable branch every day? Branch of the future discussions would focus less on design and “gut” feel, and more on profit potential and profit drivers such as demographics, visibility, personnel, deposit growth, the experiences of other profitable branches in your network, and how this aligns with bank strategy. Not how many Keurig cups were consumed last month. It is possible to view branch profitability in market clusters, if the cohesiveness of a community spans multiple towns. One branch may be a laggard, but its presence is critical to the success of the whole. It is also possible to build large branches that are successful. If a large, marquis-like branch costs $700,000 per year to run, yet has $80 million in deposits with our aforementioned revenues as a percent of deposits of 2.08%, isn’t it better than our branch of the future mentioned above that has $23 million? Using profitability as your measuring stick likely will eliminate rationalization to keep underperforming branches open. I hear arguments about poor performing branches being critical to a market area. To which I would ask the logical question, “what market area”? Let’s compare to other market area profits. Does the rationalization hold water? Constant evaluation of branching, a little growth here, a little pruning there, will be essential to effective deployment of your bank’s limited resources available to remain relevant. To keep your best performing branches and to motivate your best performing people, branch profitability can be an effective tool to make the right decisions in our rapidly changing industry. Note: The above article first appeared in the March-April 2015 edition of paBanker Magazine, a publication of the Pennsylvania Bankers Association. Jeff -- Good post. Agreed. Let me add a few more aspects of branch profitability. Let's start with the cost side. I would discourage expense allocations altogether. The branches can't do anything about them, and if the branch goes away, you are just allocating the same fixed/overhead costs over a fewer number of branches. Focus on net revenue AND net revenue growth (spread X balance by product and non-interest income) and direct compensation expense. In fact, do a compensation efficiency ratio for each branch. The branch manager can’t do anything about the lease or depreciation schedule they are stuck with (or the cost of removing snow in the northeast in the winter). What they can do is deploy their personnel resources in the most effective and efficient manner to maintain and grow net revenue. That’s where the rubber hits the road in day to day operations. Also look at growth in branch profitability. A branch going from -$150,000 to -$25,000 in “branch profit” just improved overall bank earnings by $125k. At a 12x market multiplier, that’s a $1.5m improvement in valuation. All of the sudden, this branch does not look so bad. I like your cluster view as well. It really helps to offset those situations where the account was opened up “here” but is being serviced “there” and both locations are in the same proximity to each other. At the end of the day, compensation resource should be exploiting a geographic area or market segment. The fundamental question is how well that is being done. Period. I agree that the branch manager should be accountable for the controllable expenses and that the allocation from IT is largely beyond their control. But in my travels I see inefficient branch direct expenditures for snow removal, cleaning service, maintenance upgrades which hit occupancy expense, etc. Pushing responsibility for direct branch expenditures to the lowest supervisory level would encourage more efficient allocation of operating expenses, in my opinion. But in terms of using net revenue, and net revenue growth, and branch ranking for knowing where each branch stands, we are in 100% agreement. I think banks should allocate support expenses for the full-picture branch p&l. It should be in a separate p&l line. But the relative reduction (as a % of branch deposits) of support function expenses is a critical measurement to achieving economies of scale in banking at the lowest organizational level. How often do I see banks grow, either organically or through acquisition, yet the relative cost of support functions grows, and therefore the efficiency ratio and expense ratio does not decline... often.